Why We Still Root for Tonya Ha..
Friends: Are We Still There for Them? Jason Van Dyke Sentenced to 81..
After airing a decade-long run of 236 episodes and spending a cool 15 years in syndication, Friends is turning 25 in 2019. Despite its datedness, Friends retains a fervent fan base and is drawing in new followers, one ‘The One’ at a time. But what is it about the show that continues to appeal to people, and how does it play out in today’s landscape? 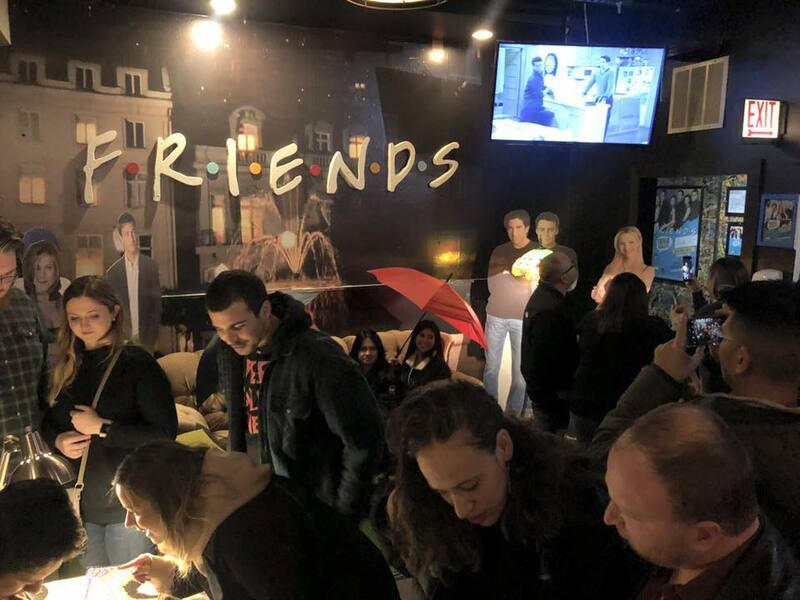 “Before Friends, there hadn’t been a television show that focused on just people in their 20s and people who were connected not for an obvious reason,” said Bri Mattia. Mattia, a second-year grad student at DePaul, is writing about NBC’s “Must-See TV” lineup on Thursday prime time for her media and cinema studies thesis. “Must-See TV” started shortly before Friends, but it came into its prime in autumn 1994 when Friends and ER were added to target the liberal and urban 18 to 34 year-old demographic. ER was an instant hit and began drawing in 30 million viewers a week with its prestige camera work, exciting cast and intense, quickly-paced medical plot lines. Friends aired earlier in the night and received around 20 million viewers in its first season, but grew in popularity when new viewers watched episodes in summer reruns. That summer, Friends entered the Zeitgeist, and the show still occupies it today. Mattia said that Friends is on the Star Wars or Harry Potter level of common knowledge, popularizing “we were on a break,” “the friendzone” and being “lobsters.” Linguists have even studied how the show has affected the way we speak. “It has that weird familiarity, even if you did not grow up watching it,” Mattia said. Mattia always loved Friends as a “cotton candy” watch and was happy when it debuted on Netflix in 2015, but was surprised when it began coming up in her life recently. This is not a unique experience. In December, Friends made headlines again when the world thought it would be taken off Netflix in 2019 — only to have the company reveal it made a nonexclusive $100 million deal with WarnerMedia to stream it through the year’s end. Resident youth icon Hayley Kiyoto tweeted at Netflix in Friends’ defense. Though Netflix keeps viewership data under lock and key, social media and other factors indicate that teenagers are watching it, Mattia said. For example, Friends was the most-referenced show in Tinder bios in the U.S. in 2018. She thinks part of its popularity with young people is the vibrant real life it presents, in contrast to something like Eighth Grade, which depicts the loneliness of this generation’s online social life. Alexis Resendez, a senior at John Hancock High School, was ahead of the curve when she watched Friends in syndication at night on Nickelodeon. All the good parts are from the first season, she said. “I feel like it’s overrated, just because I was watching it long before everyone else started watching it again,” Resendez said. Though she’s no longer into it, she knows a lot of people her age who are watching it now on Netflix, she said. For Mark Kwiatkowski, his 15 year old daughter binge-watching Friends on Netflix was the tipping point he needed to stage a Friends pop-up in his arcade bar, Replay in Lincoln Park. “It being on Netflix helps because young people get exposed to it, and honestly, lots of people were bending our ears,” Kwiatkowski said. Kwiatkowski often takes inspiration from his kids when planning and designing pop-ups at Replay, which has opened 12 pop-ups in 14 months. After observing the success of Saved By The Max, the Saved by the Bell pop-up restaurant that originated in Wicker Park and other pop-ups in Brooklyn, he began working on plans for pop-ups for his 12-year-old son’s shows, The Simpsons and Rick and Morty. Replay’s “Moe’s Tavern” pop-up was a big hit, so Kwiatkowski started to look for other cultural references that were connected to bars and arcades. The bar put on a St. Paddy’s “Paddy’s Pub” from It’s Always Sunny in Philadelphia, a Fortnite bar, a “May the 4th” Star Wars bar and several Dunder Mifflin Office parties before starting the Friends pop-up in November. After a few weeks of planning, Replay works with a group of six primary artists in the week before opening to build the given pop-up’s world. Currently, they’re working on turning the bar’s interior into the medieval realms of Game of Thrones for a pop-up beginning February 1, complete with the iron chair, maché dragons and Dothrakiquiris. For Friends, they staged vignettes from the show: Central Perk in the back bar, Joey and Chandler’s apartment on one side, complete with La-Z Boys, foosball table and canoe, the theme sequence fountain and Central Perk couch with umbrellas on the other side and Monica and Rachel’s periwinkle apartment in the elevated deck. 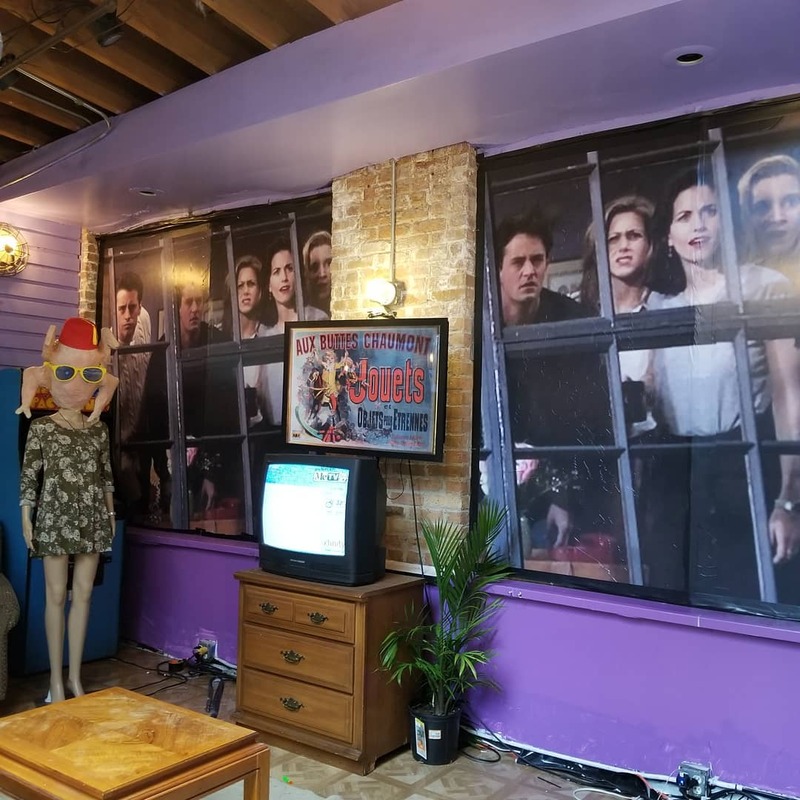 Kwiatkowski noted that the setup had been fairly easy because of the everydayness of the setting and extensive amount of content, and he was glad that the show’s women-skewed audience helped balance out the arcade bar’s demographic. The bar hosted events like a Friendsgiving night, karaoke every Wednesday, trivia, a foosball tournament and a Sunday Funday where they served the Moist Maker sandwich. A couple even asked if they could get married in the Friendstopia. Where does Friends fit now? As Friends aged and the U.S. culture surrounding it changed, criticism rolled in, even as diehard fans persist and young adults flock to stream it. Critics of the show claim the show is gimmicky, repetitive, unfunny and a privileged too-period depiction of New York City in the ’90s. Friends was filmed and written as a multi-camera sitcom where the action is filmed with multiple cameras at one time, sometimes on a stage in front of a studio audience. Single-camera sitcoms are shot more like comedy films, using multiple takes, varied lighting/locations and faster jokes. Alongside The Big Bang Theory as one of the last mainstream multicams, Friends seems slower and more situational than later single-cam comedies like The Office or The Good Place. Many of the show’s plot lines rely on gendered stereotypes and lack diversity, even compared to multicam NBC peer Will & Grace. Jay-Z’s “Moonlight” video directly parodies “The One Where No One’s Ready” with an all-star, all-black cast and points out that Friends may draw attention away from more diverse or realistic shows. However, others claim that the show’s characters are written with good intentions and that its dreamlike state and datedness hearken back to a social pre-technology era: prime escapism. “It’s like, what if you could afford this apartment in New York City and your friends would be your family and you never had to go home for Thanksgiving?” Mattia said. Hoping to appeal to Friends lovers and love-to-haters alike is Friends! 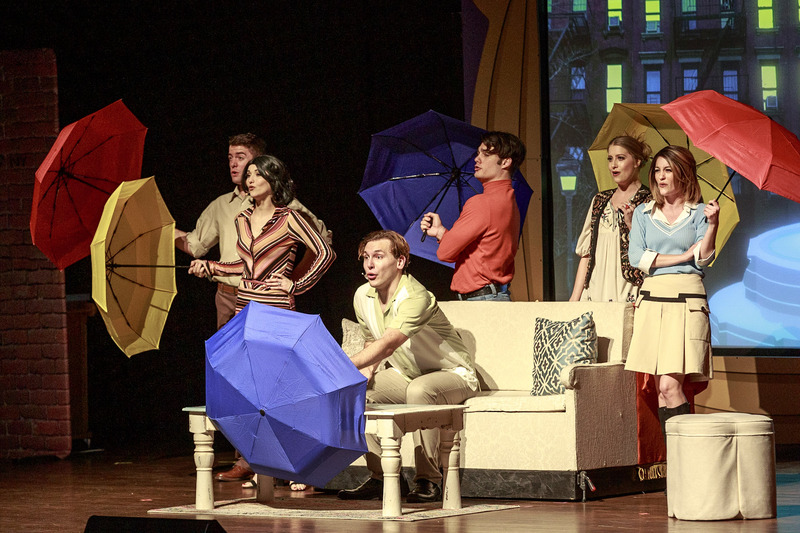 : The Musical Parody, coming to Broadway in Chicago for a few weeks on February 13. Friends! : The Musical Parody’s touring cast. Photo by Benjamin Skigen. Tobly McSmith, who wrote this show and six other pop culture parodies with Bob McSmith (no relation), remembers feeling a distance between his adolescent experience and the youth of Saved by the Bell and Friends. “We grew up watching Friends and idolizing them and thinking New York was somewhat like that, but when we moved here, it was nothing like that,” McSmith said. The duo met in New York 16 years ago, wrote a Saved by the Bell musical parody 14 years ago and charged nothing for a bar audience to see it. Bayside! 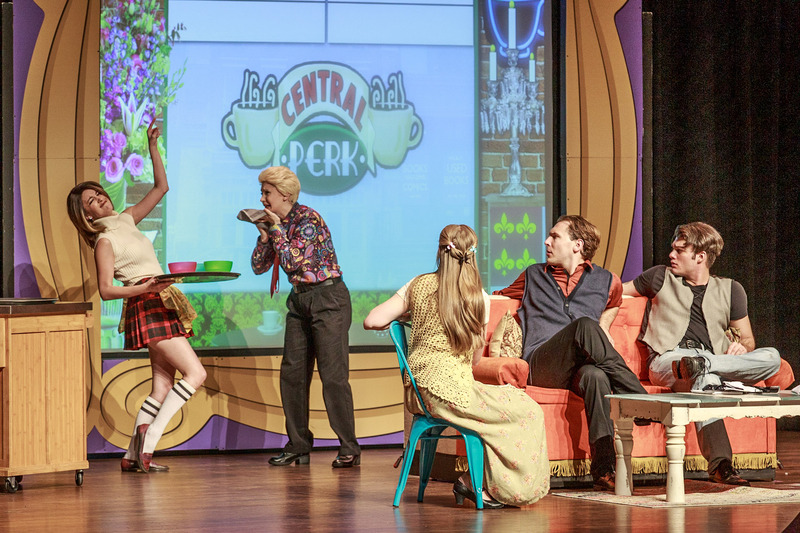 : The Saved by the Bell Musical found its way off-Broadway, and since, the duo has created a 90210 musical, a parody of Showgirls and a Full House show with a Bob Saget. They usually spend four to five months watching the show of choice and writing before bringing it to their composer, Assaf Gleizner. The “loving lampoon” follows the arc of the six friends’ lives in New York City, all the while alluding to the cast’s future, product sponsorship, wacky guest stars and the more unbelievable aspects of the show. They could not include everything from the show’s 10 seasons and chose to leave aspects out. Though some of the other McSmith parodies have inclusive updates (Slater is gay in Bayside! and Michael Scott is played by a woman in the duo’s new The Office production), they left Friends relatively intact. They wanted to keep the show relatively family-friendly and not anger the fans. “The Friends fans are truly the most fanatic about a TV show and need it to be right in their eyes, so we felt like we couldn’t go too far with the jokes,” McSmith said. Out of a decade featuring a tech revolution, a polarizing presidency, classic teen movies and multiple athlete crime scandals, a TV show with a purple apartment and a Comic Sans-ish font is what has been chosen from the ’90s to be passed down and continually obsessed over. “There’s no news in it, there’s no changing of economies, so it really is something you can watch and take your mind off all of that stuff,” McSmith said. Whether it’s the show’s timelessness, nostalgia, appeal to multiple generations or status as a comfort food show that can be used to forget about the world and fall asleep, Friends has been there, and it will still be there for our eyes throughout 2019 if we want it. Header by Cody Corrall, 14 East.